Since you can upload a snap from your Camera roll, it would not hurt if you touch up your photo real quick with Snapseed, this awesome photo editor is available free for Android and iPhone. Snapchat is usually used to upload your picture at the current moment, without any editing stuff, most of it is because in the beginning of the app, they not provide a tool to adjust the brightness and contras. Earlier in the time of the app, they just provide a doodle tool and caption. Now, with Snapchat memories, you can upload a picture from your camera roll and create Snapchat story from it, so before post it, you can touch it up a lil bit with Snapseed. 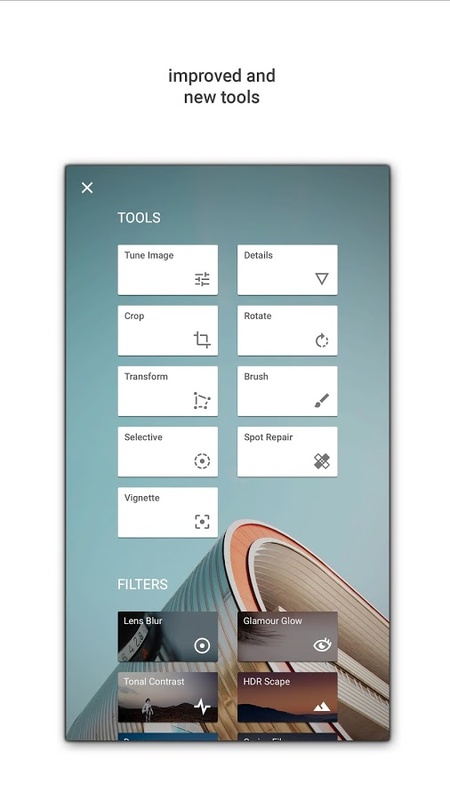 Snapseed was launched by Nik Software as a low-cost desktop photo effects/editing tool, but when Nik was bought out by Google, the app is available for Android and iPhone. First, download and install it to your Android or iPhone. launch your Snapseed app, then open a picture, choose a picture from your camera roll. To begin touching the picture, tap on the pencil icon, you can see a lot off tools. You pick a Filter – Lens Blur – for example and use a touch-and-drag on-screen gadget to move it around and control the size and strength. Other filters use touch-and-drag menus displayed directly over the image and a sideways drag to change the strength of that parameter. Once you are done, you can save the picture. It will create a new folder called Snapseed, you can find your final touch of your picture there, move the original file from your camera roll to another folder if you don’t want to delete it, then move the file from Snapseed to you camera roll so it can be detected by Snapchat Memories. Now launch your Snapchat app, make sure you have updated your Snapchat app to the latest version to get Snapchat Memories feature. Tap on the smaller white circle underneath the shutter button to access Memories. You can also swipe up anywhere on the screen. Tap and hold on the picture you have just created from Camera Roll. A black border will appear around the photo. Tap the little white pencil in the lower left corner. Now you can put some stickers, doodle, or caption for final touch. When you ready to publish it, Tap the arrow in the blue circle in the lower right corner. Snapseed is a powerfull tool to touch up your picture and it’s easy and quick, really suitable to fix your picture before you upload it to Snapchat. Make sure your folks also know about Snapseed and how to use it to create a Snapchat posts.